A HOUSE is on fire in Kingsley. The fire at the property near Peckham Crescent was reported on Tuesday at 5.29pm and Department of Fire and Emergency Services are on the scene. There is also a bushfire advice in place for parts of Pinjar with an out of control and unpredictable fire burning. DFES issued the alert at 4.50pm on Tuesday for people travelling on or in the vicinity of Old Yanchep Road, near the intersection of Wesco Road. This is where the fire is believed to have started – reported to DFES at 3.49pm. It is burning on the eastern side of Old Yanchep Road and moving at a moderate speed in a south westerly direction. Bush Fire Service and Parks and Wildlife Service firefighters are on the scene and City of Wanneroo is managing the fire. There is no threat to lives or homes but there is a lot of smoke in the area and people are urged to be aware and keep up to date in case the situation changes. Residents in the area should close all doors and windows, and turn off evaporative air conditioners but keep water running through the system if possible. Drivers should take care, turn on their headlights and drive slowly. 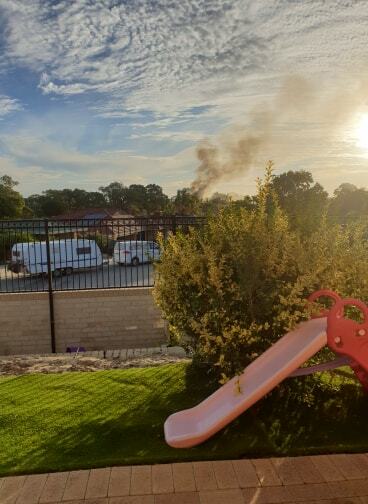 The alert follows a vehicle fire in Pinjar reported at 3.32pm.